The limit between Art Nouveau and the fonctionalism school (Bauhaus) of Gropius is very moving. It depends a lot of the point of view. The architect Behrens is seen for instance as belonging to the two movements. The German word for "Art Nouveau" is Jugendstil. Literaly it is the style of the magazine called "Jugend" (which means youth). Jugend was created in 1897 in München. In 1900, the German empire was governed by the Prussian, and it was divided in many "great dukedom" that had a limited autonomy against the central power of Guillaume II. Its borders included Alsace and Lorraine which were annexed in 1870 from France and are now back to France. The town of Strasbourg is therefore described in a german context. Various Secession movements were created in the main towns of the german empire at the end of 19th century. This movements and artists in "applied arts" are relatively well studied whereas Art Nouveau architecture is not as well known in Germany today. Despite of the destruction of World War II, nearly every big town of Germany still have Art Nouveau buildings that you can find in no books but by wandering in 1900 blocks, often architectural guides ignore them. Hagen is a town near Dortmund. This experience was widely similar to Darmstadt one. It was created by the manufacturer and mayor of the town: Karl Ernst Osthaus (1874-1921). The main Art Nouveau artists were: Van de Velde, Behrens, Lauwericks. Other artists gave a contribution to the town: Le Corbusier, Mies van der Rohe..
A map of the interesting local Art Nouveau places is available from the Karl Ernst Osthaus Museum in Hagen. Headed by the architect J.M. Olbrich, the colony staff was also compounded by P. Behrens (painter and decorator and then architect), H. Christiansen (decorator), P. Huber (decorator), L. Habich (sculptor), R. Bosselt (..plasticien..), P. Bürck (decoration painter). In 1904 arrived the ceramist Jakob J. Scharvogel, in 1906 the glass blower Josef Emil Schneckendorf and in 1907 the book craftsman Friedrich W. Kleukens. In 1914, the group is headed by Albin Müller who replaced Olbrich (dead in 1908). He is surrounded by Bernhard Hoetger (majolica craftsman), Ernst Riegel (goldsmith), Theodore Wende (goldsmith) et Emanuel Margold (pupil of Hoffmann). Museum Künstlerkolonie (House ...). It was built as a temple for the Arts and has now been turned to a nice museum. House Müller: the most terrific house in Darmstadt. Hochzeitsturm (Wedding tower): It is visitable but don't unless the wedding room is open. The fare is expensive for a poor sightseeing. It is an AN fan trap. Just enter the hall and look at the mosaic. That is all that you would pay for and it is not worth. This tower was a wedding gift to the great duke from the town. The symbol is unity and complementarity as the 5 fingers. The sezession of München was created in 1892. The main artists were Habermann, Uhde, Kuehl, Zügel, Herterich, Heine, Liebermann, Eckmann, Behrens, Olde, Trübner, Menzel, Stück, Slevogt, Corinth, Riemerschmid, Endell. The main area for Art Nouveau builings is in Schwabig village. The Jugendstil was named after the art and design magasine "Jugend" which was created in 1897 in Munich. According to some people, it was pure hazard that it has been created in this town as Munich inhabitants where very conservative. There are lots of Jugendstil buildings in Munich and particularly in the Schwabig quater. These buildings are often very similar to the standard Munichan house except that they have a Jugendstil stuccos instead of baroco ones. It is very rare to find a stone building. Most of them are covered with a neattly painted roughcast or coating. 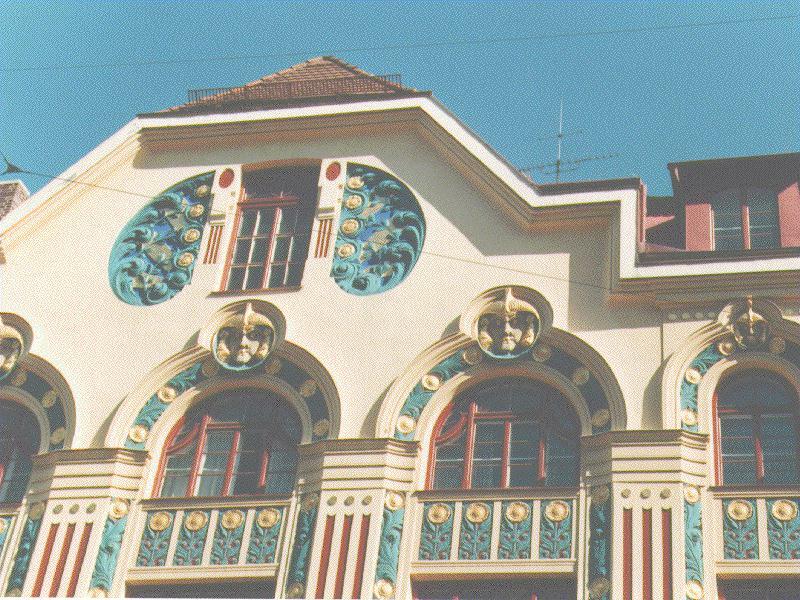 Jugendstil architects often play with surface and color effects on the roughcast. The stucco patterns are representing owls, peacocks and vegetals. Geometrical patterns are rarer. The wellknown Jugendstil woman face is also widely represented. The houses are often cubic with regularly spaced windows, some of the AN buildings use a more modern structure with large window bays. Curves come with height in the roofs that are inspired by tradition. The most wellknown facade of Munich disapeared with world war II (Elvira Workshop by Endell 1898). Secession movement in . Although, it was entirely destroyed in 1945, there are still more than 50 Jugendstil buildings up. Place of the future Bauhaus. **** Guenter Hauenstein's Jugendstil site In German. 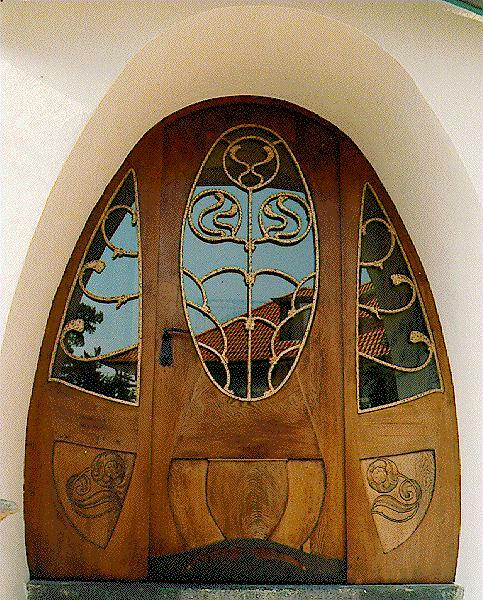 Numerous addresses of Art Nouveau buildings mainly in Germany and also an Artist list. *** Villa Weigang In german. Wonderful Jugendstil villa. *** Around 1900 in Dutch and English by Jalf Flach. Numerous pictures and addresses. ** Jugendstil in Bad Nauheim in German-English and french. The site also propose a walk around the main jugendstil buildings of the town. More specific links about Darmstadt can be found in the dedicated sections.